Let’s face it. We live in an ever-increasing culture of distraction. According to research, our attention spans have dropped to just 8 seconds (a whole second less than a goldfish!). As presenters, we have to understand that this statistic directly correlates to our audience’s ability to listen. However, even though we know our attention spans are shrinking, we, more often than not, stick with the same techniques we have used for years, which can leave our audience bored and disengaged. For nearly a decade, I’ve presented to thousands of middle school students each year. You would be hard pressed to find a more easily distracted audience. Whether they are looking at their phones, poking their neighbor, or just flat out not listening, this age group will find any reason to not pay attention during a lecture. But, over the years, I’ve found that there’s one thing that will always help them re-engage: Movement. If I’m able to incorporate movement into my presentation, I notice a significant difference in my audience’s attention span, and I can tell they’re actually listening to my message, which, of course, is every presenter’s ultimate goal. While working with older audiences, we at Ethos3 have found the same to be true. 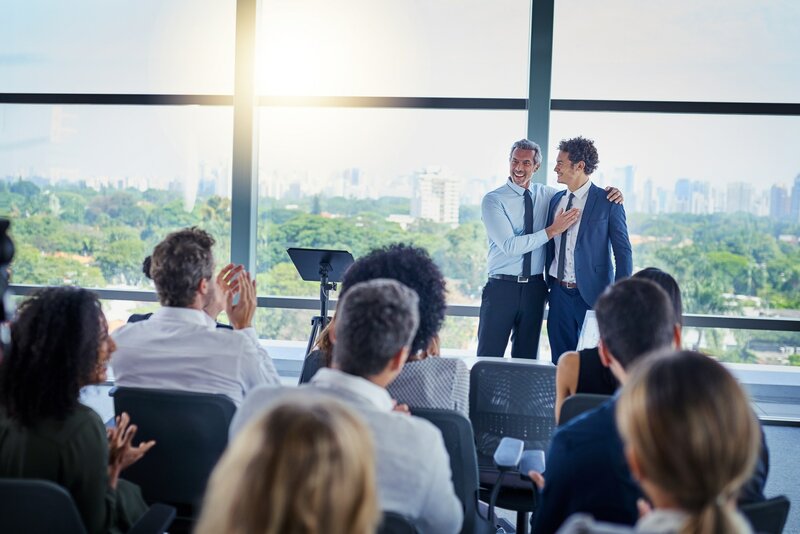 Getting your audience moving and engaging with each other will not only help them stay connected to what you have to say, but also restart the attention span clock on your presentation. Here are 3 ways to get your audience moving and listening to everything you have to say. A great way to get your audience moving is to give them an incentive, and who doesn’t love free stuff?? Whether it’s something as big as a free trip or as small as a branded pen, people love something they don’t have to pay for. Try This: Reinforce the content you have delivered by asking questions about what you have just shared. Give a prize to the first person to race over to you with the correct answer. I have seen first-hand the power in placing people in teams and setting them out with a task in mind, which is exactly what a scavenger hunt will do for your audience. It’s important to note that this trick does not work for every audience or every presentation, but is a great tool during a longer presentation or for a team-building exercise. Whether you are presenting to an audience of complete strangers or best friends, human bingo is a great way to help everyone get to know each other better. It is also a way for you to get to know your audience on a personal level, ultimately breaking down the speaker-to-audience barrier. Try This: Create a human bingo sheet with topics based around your content. Introduce yourself and begin to build rapport with your audience, then pause and take 5 minutes to play human bingo. Be sure to give a prize to the winner, and make sure you compete yourself. Unsure of what human bingo is? Click here. While it may feel unorthodox or even childish to include activities in the middle of a professional presentation, it isn’t. In fact, activities are crucial to keeping your audience engaged and connected with what you have to share. It’s the reason that colleges like Yale and Harvard are moving away from lecture-style teaching in exchange for workshops and activity-based teaching styles. Adults want to have fun, too, and if they’re having fun, chances are that they’re more engaged, interested, and tuned in. Create engaging moments with your audience, and they’ll pay much closer attention to what you have to say. If you want to learn more powerful tips and tricks the Ethos3 team has discovered, check out the Presentation Mentor online course today!